Last week found me in Lewistown, Montana, attending and speaking at the annual Montana State Beekeepers convention. Montana is one of the largest producers of honey in the United States. In 2013 almost 15 million pounds of honey was produced by beekeepers in Big Sky Country. One might think that this very northern state, Montana’s northern border is with Canada, would not be a great area for honey bees. While the winters are very cold in Montana, in summer the plains explode into color with blooming plants, including yellow sweet clover. Coupled with extremely long days, which give bees more time to haul in nectar, production of 200 pounds per hive is not unusual. • Montana has only about 200 (registered) beekeepers. Of this 200, 36 are commercial beekeepers, who are responsible for the vast majority of the 14 million pounds of honey production. This equals about 417,000 pounds (35,000 gallons) of honey per beekeeper. 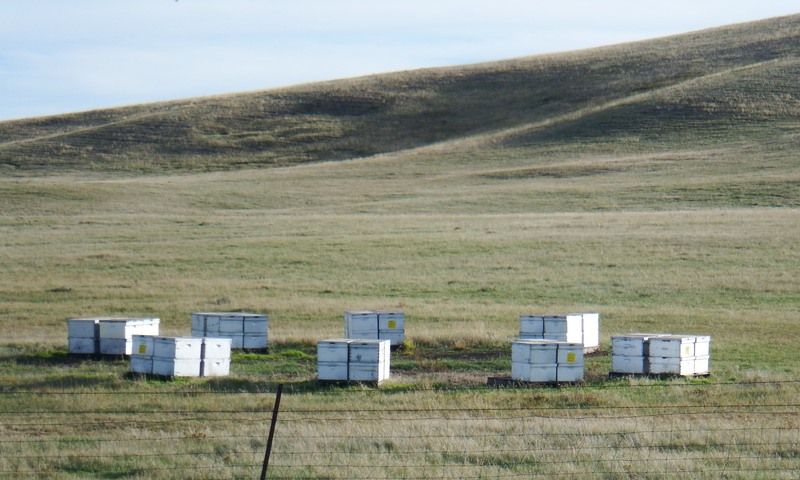 • There are approximately 145,000 hives in Montana, again the vast majority – if not all (the small scale beekeepers may not be included in these hive count statistics) – are owned by these 36 commercial beekeepers. This equals about 4000 hives per beekeeper, which does not surprise me. Often when I am at meetings where there are large numbers of commercial beekeepers, I’ll hear I’m only a small beekeeper, I just have 1,500 hives! • With production of 15 million pounds and 145,000 hives, we get an average yield of 100 pounds per hive, which many beekeepers would consider excellent. However, I had beekeepers at this year’s Montana state meeting tell me that this year (the statistics I have been quoting are for previous years – 2014 information is not yet available), many hives yielded 200 pounds this year. the best production was in Eastern Montana, due to better rainfall. This entry was posted in Phil's travels!, What other beekeepers are up to. Bookmark the permalink.